This study of politics in Visnudharmottarapuranam brings to light many interesting facts related to political system of those days. It mentions seven limbs of the State and describes the Kings as the basis of all other parts. He had to be protected at every cost so that he would be able to promote the growth and development of other parts - the minister, the people, the capital, the treasury, the army and the allies. This Puranam, compares the King with a pregnant woman who sacrifices all her comforts for the sake of protection and development of the embryo. His main duties are punishing the evildoers, honouring the good, making money through the evildoers, honouring the good, making money through righteous means, ensuring security of the nation and maintaining impartiality in administrative justice etc. which will be of interest to readers of ancient Indian polity. 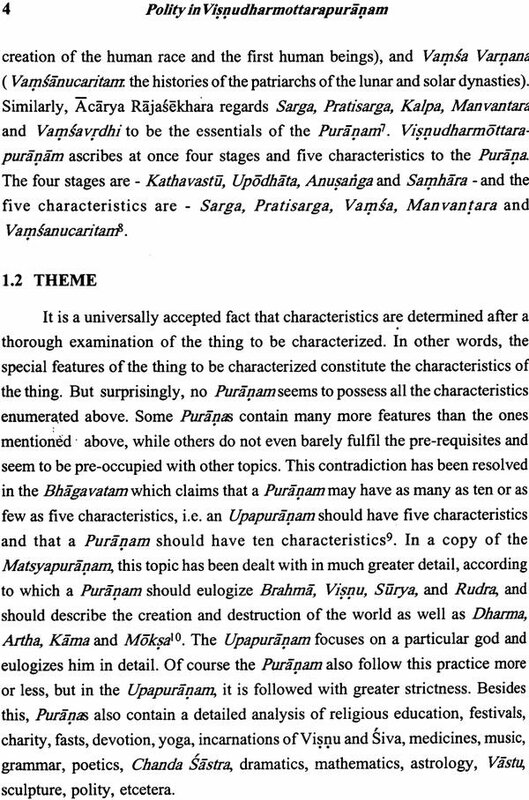 The Puranas are the encyclopaedia of Indian Literature. The great elements contained in the Puranic literature have been studied in detailed by the Indian and the foreign scholars. The prominent among them are F.F. Positer, F.E. Curfill, H.H .. Wilson, Wintemitz, R. Martin, B.C. Majumdar, A.Banarjee, V.R. Dixitar, D.R. Mankad, A.S. Altekar, Yadunath Singh, K.P. Jayaswal, Dr. A.D. Pusalkar, V. S. Aggarwal, D.R. Patil, Jagdish Lal Shastri and B. B. Mishra. 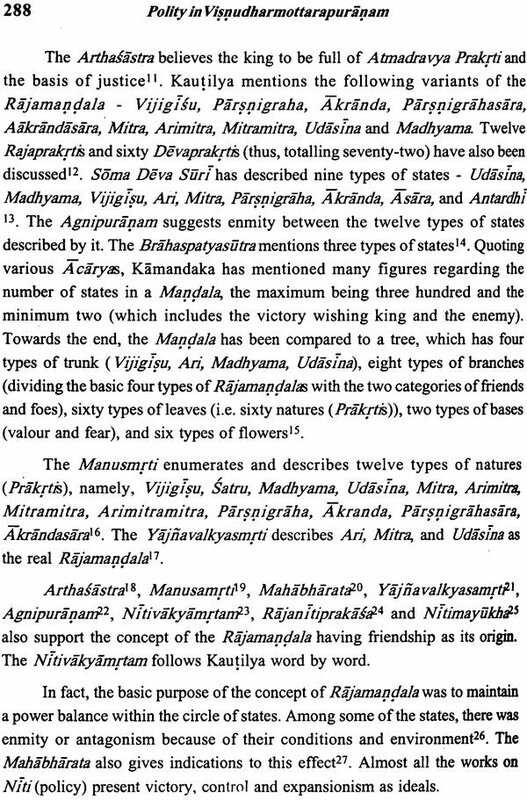 Some of these scholars have written research papers and works on the politics related material in the Puranas Stella Kramrisch, Dr. Priya Bala Shah and Ashok Chatterji Shastri have published works on the Vishnudharmottarapuranam The last two among these, "A Study on Sanskrit Text of Ancient Arts" and Vishnudharmottarapuranam - Citrasrtam', are related to art. 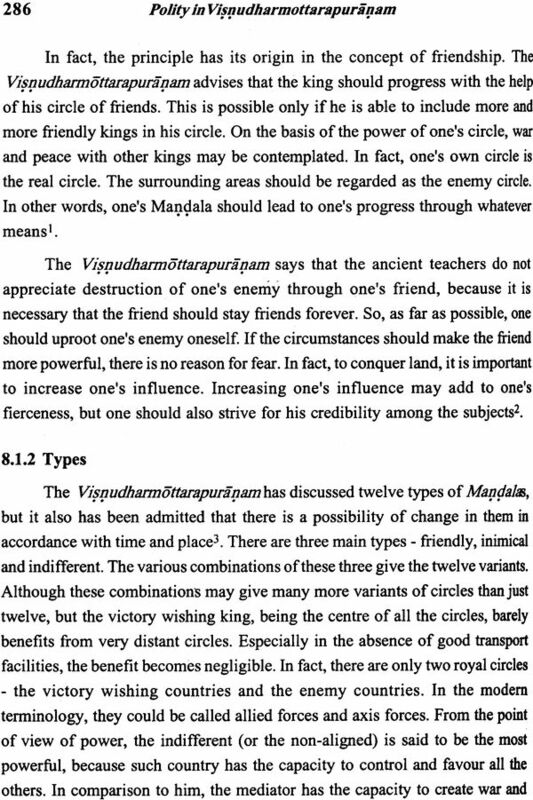 The present work is the first research attempt dealing with polity in the Vishnudharmottarapuranam Amazing facts can be brought to light by researching other topics in the Puranam. Hopefully, the learned intellectuals and research scholars would pay attention. In spite of having attained a respectable place in MA Sanskrit from the Banaras Hindu University, and in spite of having a keen desire to serve the cause of research in Sanskrit, I could not pay single-minded attention towards research. The credit given by my friends for some of my achievements only proves their generosity. In fact, these achievements have rather proved to be hindrances. Certainly, the fault lies not in the circumstances, but in my own "dreamer's attitude". The credit for breaking this tendency of mine goes entirely to Dr. Ved Kumari Ghai, Professor and Head, Post Graduate Department of Sanskrit, University of Jammu. The present work, from the beginning to the end, is the result of her good encouragement and able guidance. I am really grateful to her for her hard work and benevolence. I am also grateful to Dr. Murali Dhar Pandey, Dr. Baljit Nath Pandit, Dr. Bal Krishan Shastri, and Dr. Dhani Ram Shastri for their munificence in allowing me to consult the books from the Library of Sh. Ranbir Kendriya Sanskrit Vidyapeetha, Jammu and Sh. Ranbir Sanskrit Research Library, Jammu. The immortal works 'Dharmasastra Ka Itihasad (The History of Dharmasastra) by Dr. P.V. Kane and 'Studies in the Upapura'Jas' by Dr. R.C. Hazra have been duly consulted. I am also grateful to the other scholars whose works have been consulted for preparation of the present work. Finally, it is my pious duty to bow my head before the all-embracing blessings of my venerable father Late Pt. Raghunath Shastri. Whatever, I am today is the result of his best wishes. I feel privileged to write a few lines by way of preface to this work “Polity in Visnudharmottarapuranam “.Visnudharmottarapuranam, which has compiled at Jammu or Its neighbourhood in Circa 5th century AD, is an encyclopaedic work dealing with various subjects like mythology, cosmogony, cosmology, astrology, polity, sociology, religion, medicine, agriculture, animal husbandry, art and architecture . Dr. Priya Bala Shah and Dr. Stella Kramrischhave worked on the portions dealing with art and architecture. Two research projects on the Puranam a study of polity (in Hindi) by Dr. Dev Rattan Shastri and a socio – religious study (English) by Dr. Kusum gupta were completedunder my guidance at the University of Jammu. It is a mater of great satisfaction that sheri Sahrat Chander Sharma who is an Associate Professor of English at Rashtriya Sanskrit Sansthan, Shri Ranbir Campus, Jammu has brought out an English edition of the original researches work done by this father Late Dr. Dev Rattan Shastri. 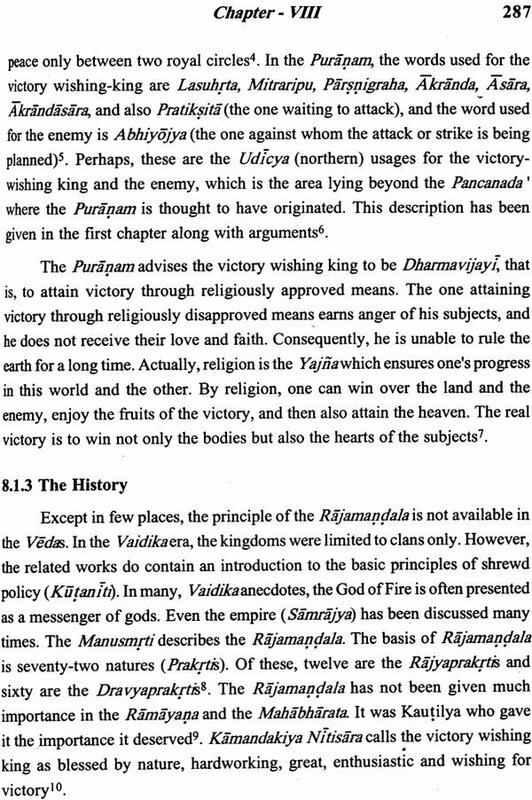 Polity in ancient India was called rajaniti i.e. Ethics of politics or poltical Ethics. Another term used for polity was rajadhara i.e. 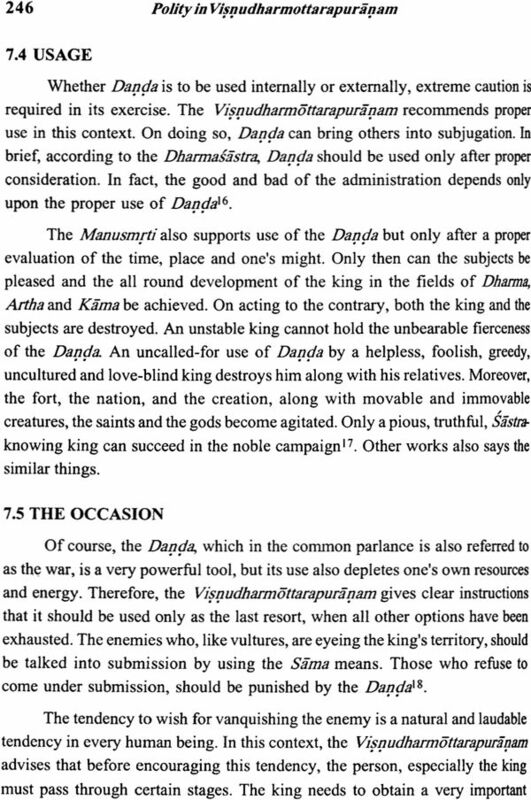 moral duties related to the King. It means that politics was not discovered from ethics as is being witnessed today. This study of political system of those days. 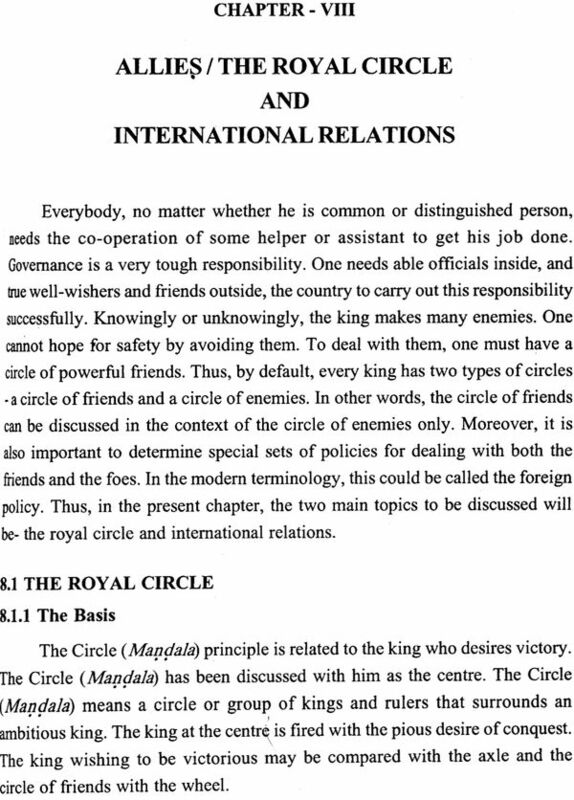 It mentions seven limbs of the state and describes the King as the basis of all other parts. He had to be protected at every cost so that he would be able to promte the growth and development of other parts – the minister, the people, the capital, the treasury, the army and the allies. Kingship was hereditary, no doubt, but, according to this Puranam, utmost care was to be taken to inculcate all good virtues in the prince and to keep him away from vices like warth, avarice, etc. If in spite of all the training it was not possible to inculcate good qualities in him, he was to be arrested and sent to some secret place. An unbridled prince could not be given any responsibility as he would lead the royal family to destruction. This Puranam, compares the King with a pregnant woman who sacrifices all her comforts for the sake of protection and developments of the embryo. His main duties are punishing the evildoers, honouring the good, making money through righteous means, ensuring security of the nation and maintaining impartiality in administrative justice. The role of the Chief Queen in governance, as described in detail in the puranam, indicates the high level of educational training she was expected to have and proves her importance in the politics of the country. She was to be well-aware of activities not only of her own country but also of the neighbouring countries by sending ambassadors and establishing contacts with her counter parts in those countries. There are many other points which will be interest to students of ancient Indian polity and I am sure that work will be received well by scholars and students alike. I congratulate shri Chander Sharma for the good Job. 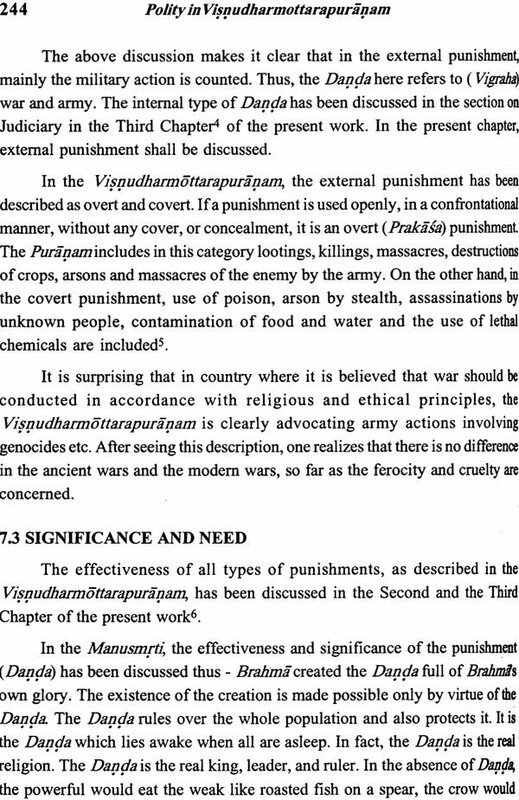 I would Like to add one more point regarding Visnudharmottara – Puranam. 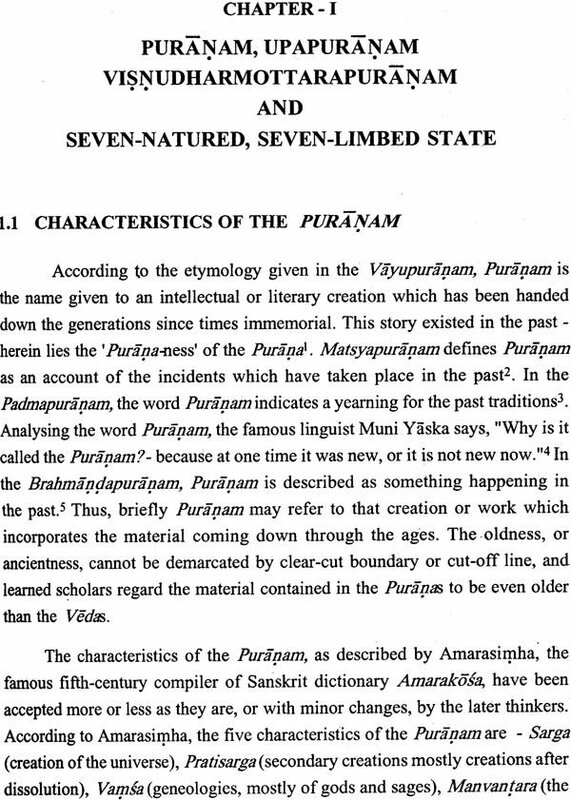 There is a long felt need for a critical edition of the Puranam , as the only edition available in the market is the same as published by Vekatashwara press, Bombay, long back , and it is not a critically edited text. There are more than forty manuscripts of this Puranam available in the various MSS libraries in India and abroad. The Puranam being very big with more than seven hundred subtopics described in several thousands verses, it will be a Huge task to collect the Mss material, collate the various text and bring out an authentic text with Hindi/ English translation. It will be a huge task to collect the MSS material, the various texts and bring out an authentic text with Hindi? English translation. It will be a project worthwhile to be undertaken by a team of scholar, either through Rashtriya Sanskrit Sansthan, New Delhi or any other university of the area. Since Times immemorial, India has exercised a strange charam world. All shorts of seekers have felt this pull – seekers after power, riches, Knowledge , and spiritual enlightenment, throughout the centuries to this day, have been drawn to this land in the east of the Indus and in the South of the mighty Himalaya. The Plunderers called it the Golden sparrow – they came, they put cities to sword and fire, and they returned home with their loot. The seekers of Knowledge came and sat near the feet of the Masters and returned home with wisdom and enlightenment. 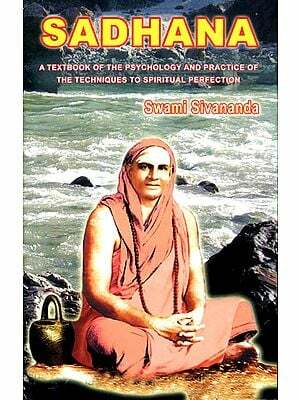 They hailed India as the Jagadguru- the teacher of the world. Rivers of Knowledge flowed from this Land to Indo China, Japan, the middle East, and Europe. Much of this knowledge was enshrined in one of the greatest repository of human knowledge – the ancient Sanskrit literature, of which the Puranas from an intrinsic part. The Puranas are primarily ancient Hindu religious texts (though other religions, like Jainism and Buddhism also developed their own Puranas). While other ancient religious books in Sanskrit, such as, the Vedas , the Upanisadas, the bhgavadita, the Ramayana the Mahabharata , etc. appear to be esoteric by virtue of their limited numbers, the puranas seem to be products of a more democratic endeavour. By their sheer numbers and the various likely places of their origins , they seem to be natural outpourings of grass – rot level scholars of the times, although sticking to the time honoured tradition of the ancient Sanskrit literature, their authors were so humble as to deny themselves the Credit of their authorship. Through the Puranas, virtually every region of this amazing land of the Indian unity in diversity, which has proved to be such a mind – boggling phenomenon for the world, has roots in this common thread of shared social intelligence. Today when the overwhelming and mindless emphasis on regional identity in the country has unleashed centrifugal forces threatening the unity and integrity of Indian nation, the puranas hold the key to creating a balance between regionalism and nationalism. They tell us how the various regions must make a common cause of strengthening and empowering the national unity, leading to a rock –hard axle on which the wheels of democracy turn effortlessly a like a well a –oiled piece of machinery. Nilamatapurana of Kashmir and the Vishnudharmottarapuranam of Jammu are the contributions of the presents Indian state of Jammu and Kashmir to this Vast cornucopia of ancient Indian wisdom. They show that in spite of various historical vicissitudes, this was a part of the Great Indian nation through the Centuries and Walked the Path of cultural, spiritual and literary development, and in hand with he rest of the subcontinent. 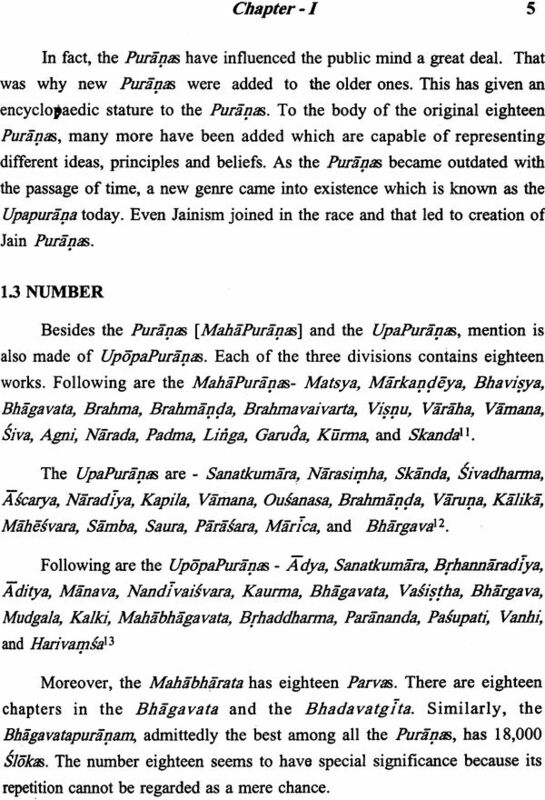 Altough, for convenience, the puranas have been subdivided in to the subcategories of Mahapuranas Upapuranas and Upopapuranas , each having eighteen puranas, the fact is that there are a number of extant lists of Puranas each having its own listed puranas and the total number of listed puranas goes much beyond 54. (The Visnudharmottaranam is listed in the category of Upapuranas by Brhaddharmapurana (i.25.23-26) Add to this the fact that an untold number of puranas and other Sanskrit work is perished in the devastating attacks by the foreign marauders, and we begin to see the to see the fecundity of the ancient Indian philosophers and writers who wove their own unique patterns in the Vast nationals Fabric of India. 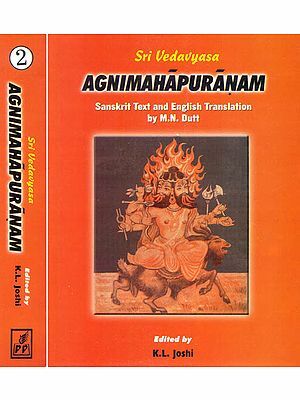 The Present book is an attempt to put before the International reader, an aspect of ancient India life as described in the Visnudharmottrapuranam far the only significant work on the Puranam is by Stella Kramrisch which studies the fine arts as mentioned in this Puranam But as the Wikipedia entry on the Visnudharmottarapurranam points out that ‘the Visnudharamottara puranam (or the Visnudharamottra) is a Hindu text, encyclopaedic in nature. Along with the narratives, it also deals with cosmology, cosmogony, geography, astronomy, astrology, division f Time, pacification of unfavourable planets and stars, genealogies (mostly of King sages), manners and customs, penances, duties of Vaisnavas, law and politics, war strategies, treatment of diseases of human beings and animals, cuisine, grammar, metrics, lexicography, metrics, rhetoric, dramaturgy, dance, vocal and instrumental music and arts.’ The Present work seeks to highlight the political system r the polity of the contemporary India. While the editor has tried to keep as close to the original work as possible, the notes have been given in Devnagri as well as Roman with diacritic marks so that international readers too find the book useful. If the learned readers find some merit in the book (original and the English translation, both), the Credit goes entirely to my venerable father and teacher, Dr. Dev Rattan Shastri. In translating this work, I pay homage and express my gratitude to my mentor and guide. Today, when he is no more, I am able to see how he shaped me during his lifetime and what a wretch I would have been had he not been there oversee my growing up. He chose Sanskrit as a subject for me and taught me so that it stayed as a subject with me right up to graduation. And it was he who supported me whole – heartedly when I expressed a desire to pursue in English. And I am so grateful to God for blessing me with such wonderful teachers to learn beauties of English from – prof. B. L. Bhatt, Who taught me how to read the dictionary, when I was at poonch college, and prof,. colleges, and prof.. Apurab Somnath Bhakhari, who added magic to my years at Department of English, University of Jammu. I am highly obliged to prof. Ramanuja Devananthan, Prof. H.N. Tiwari and Prof. Manoj Mishra for their encouragement and support. I feel honoured that professors Ved Kumari Ghai very Kindly consented to write a preface to the English version of the book. The original was based on the research work my father undertook under her able scholarly guidance was based on the research work my father undertook under her able and scholarly guidance and it was only apt that the English translation too should have her endorsement. I would also like to acknowledge the help rendered to me by Dr. Varchaskam Sharma, Who so meticulously checked the proofs, particularly of Sanskrit parts, and my son Samarthya Sharma, who bailed me out whenever there were computer –related issues which I could not tackle on my own. Finally, I must thank my mother, Mrs. Rama Sharma, who, through her constant and emotional goading and prodding , helped me complete the work, although over a long period of fourteen years. For her sake, I wish I could fulfil her dream much earlier but sons would be sons, easily distracted by other fancier activities. To her, I owe apologies as well as thanks. I express my profound gratitude to prof. K.E. Devanathan ji, Hon’ble vice-chancellor, scholar par excellence of Sri Venkateswara Vedic Uniiversity, which is functioning under the foot of the sacred seven Hills, the abode of sri Venkataeswaraswami ji, who has readily accepted to bring out look in no time. I record my deep sense of gratitude to be Prof. G.S.R. Krishna Murty, an outstanding scholar and poet and Dr. A.V. Radhe Shayam, Deputy Director, Research and publications and his young, dedicated and dynamic team of scholars who have put all their efforts in editing and bringing out my work in such a quick time, which will be useful to the scholars and researches and students. I think one and all in the SV Vedic University in this effort.